Why do I have to pay BHHCA $130.00 a year and where does the money go? The $130.00 annual dues mainly pay for our street lights. We pay about $1100 per month to LG&E for street lights. $30 per home is used for the Winter Snow Removal Fund which began with the Spring 2009 Dues. There are also expenses for a mailbox, this website, billing and collection of dues, newsletters, postage, entrance signs/lighting, and vandalism. What if I pay my dues late or don’t pay them at all? If dues aren’t paid, it results in additional interest penalties. As a last resort it could be turned over to a collection agency and/or a lien could be put on their property for the amount owed plus filing fees and attorney fees. When must annual dues be paid? Our fiscal year is April 1 to March 31. Dues must be paid by April 30th every year. I received a second notice for my dues but I have already paid them? If anyone receives a 2nd Notice, that means their dues were not paid. We check and double check this information very carefully before a 2nd notice goes out. If you think payment has been made, verify that the check has cleared your account. If the check has cleared, we ask that you get us a copy of the cancelled check. What's the best way to find out what is happening in my neighborhood or tell my neighbors my dog is missing? Do we have a facebook page? Yes. We now have a page. Be sure to us to stay up to date with all the happenings in your neighborhood! We often get emails regarding a lost or found pet, suspicious activity or people wanting to promote their yard sale. Now you can do so yourself by posting on our Facebook page. We would love to see ALL our residents using this as it is a great way to communicate with your and watch out for your fellow neighbors! We also sent out emails several times a year, but try to keep them at a minimum by only sending out important notices. My next door neighbor let's their dog run loose. Can they do this? No. Jefferson County has a leash law. 91.002 RESTRAINT REQUIRED "All animals shall be kept under restraint at all times as defined in this ordinance, and any deviation or violation thereof is strictly prohibited." You can see the law here. If you have a complaint about a pet, contact a Board Member. You can also call Jefferson County Complaints and Stray Animal Pickup at 502-363-6609. The ditch behind my house needs to be mowed. Does MSD do this? No. The common area behind your house needs to be mowed by you. Tall grass and weeds encourage insects and rodents to homes. According to BHHCA Declaration of Covenants, Conditions and Restrictions, lawn maintenance is required and can be subcontracted. In other words, if you don't cut your grass, the BHHCA will have it done for you at your cost. Beginning in 2009 we will have funds just for snow removal and brine. Jefferson County does not do snow removal in our subdivision. $30 of each homeowners dues are set aside solely for this purpose. We provided limited snow removal for the ice storm of 2009 and received an overwhelmingly positive response. Any homeowner can call LG&E @ 589-3500 to report the problem. It is an automated system. They just need the address of the home next to the street light when calling. We pay a flat rate for each light whether it works or not, so please report outages promptly and don’t assume someone else has done it. How do I arrange for weekly trash collection? We have a contract with Republic Services/ID for trash collection at a rate of $11.15 per month + applicable fuel fees. ID provides up to two FREE containers. Recycling and yard waste cost extra. Recycling Service; Every-other-week: $4.50 per month per home; billed directly to resident. Use of 65 or 96 gallon cart required. Yard Waste Service; $5.50 per month per home; April 1 - Jan. 15. Please note: ID may increase billing during the contract period should there be any increase in government taxes, fees or surcharges. The cost could also go up if they experience uncontrollable expenses such as fuel costs/oil based additives, landfill/environmental charges, etc. beyond their control. 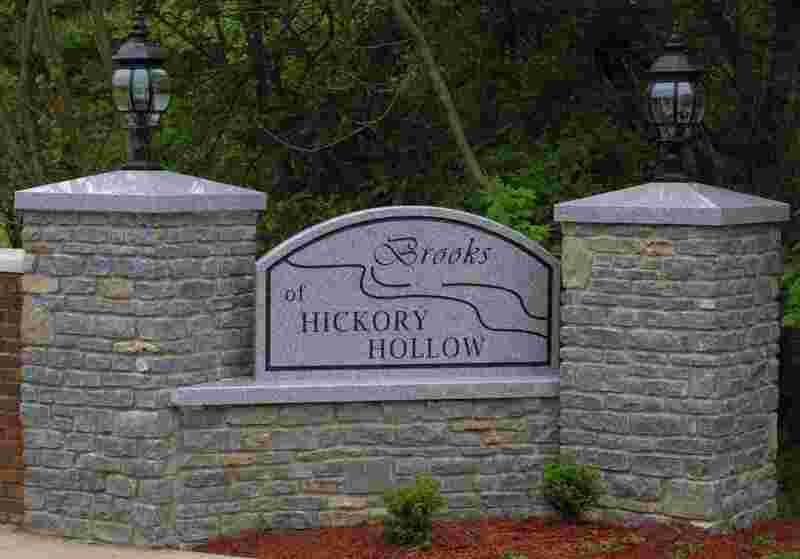 Call ID at 638-9000 and mention the agreement between ID and the Brooks of Hickory Hollow to get service at this special rate. NOTE: Please put your trash container(s) on the side of your driveway AWAY from your mailbox. This will allow the automatic lift to operate without interference. The Street Sign and Stop Sign on my street have been knocked down. Who do I call? The homeowner can call Metro Call @ 311 to report the sign that is missing. My sidewalk in front of my house is cracked and in bad shape? According to Jefferson County, it is the homeowner’s responsibility, but Jefferson County might make the repair if it is a “trip hazard”. This means the side walk is raised or buckles more than 1 inch. You can call Metro Call @ 311. Can I park my car on the street in front of my house? No. Street parking is not allowed according to the BHHCA Declaration of Covenants, Conditions and Restrictions. Vehicles must be parked in your garage or driveway. I just bought a new boat. Can I park it in my driveway? No. Vehicles like boats, trailers, motor homes, jet skies, tractor trailers, commercial vehicles, etc. are not allowed to be parked in the Brooks of Hickory Hollow unless they are kept in an enclosed garage. My neighbor blocks the sidewalk everyday with their car, what can I do? It is a violation of the BHHCA Declaration of Covenants, Conditions, and Restrictions and Jefferson County Ordinance to block a sidewalk or park in the grass. You can request the board send a letter to the homeowner or contact Metro Call @ 311 for assistance. You may contact any Board Member with any questions. All of these people are listed on this website.